If you have spent any significant time with an infant or toddler, you likely noticed that the child shows a pattern of engaging in repetitive behaviors or play. For example, young children can gravitate toward the same books, games or even make toys/objects interact the exact same way. This repetition may seem boring and tedious to us as adults but babies and toddlers thrive when given the opportunity to perform an action over and over. Babies are little scientists taking in their world quite literally through cause and effect, learning that when A happens, B is the result. The classic game of “dropping an item to see if caregiver picks it up” is a great example of this. Children learn and strengthen connections in their brain by repeating actions and words. Reading a story over and over, playing peek-a-boo, stacking blocks and knocking them over again, or banging blocks together may become boring to you but your child is learning that there is a predictable outcome that will remain the same. This helps children learn information, build confidence, feel successful, build trust and security, and anticipate what might be coming next. Because repetition and practice are so crucial to learning new things, it is important to promote your child’s natural exploration. Providing the time and opportunity to sing favorite songs, read books, fill up a bucket and dump it out, build block structures, and other forms of repeated play can support their development in profound ways. Don’t try and redirect the play toward your own interests or agenda (or to relieve your boredom). Instead, make the whole process more interesting to you by engaging more enthusiastically with your child’s excitement. Reflect back what you see them doing (e.g. “I see you having so much fun knocking over your tower! How cool is that?”). Allow yourself to get excited or silly during the play (remember, no one is watching). Get into character and try out different voices while reading or add funny lyrics that fit in with your child’s most requested song. You are likely to notice your child feeding off your own excitement, and this could allow for a mutually rewarding experience of bonding. 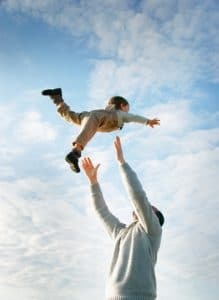 Moreover, the child is forming healthy attachment to you through the positive interaction and ultimately developing an understanding of the world and their ability to participate in it. Consider giving your child time to explore through independent play. Offer a few toys, preferably not battery operated, and let them explore and manipulate, blocks, buckets, and noise makers of all types. If your child is happily playing by themselves, let them go! This builds independence and allows them time to learn what they like to do and how things work. Aside from repeating actions or play, creating a coherent and predictable schedule for your child can also help establish healthy routine and habits. It is comforting to children to know what is happening next, and a consistent, repeatable daily schedule can help them achieve a sense of trust, safety, and security. Developing schedules for mealtimes, nap, bath, bedtime and for transitioning from one activity to the next will help you as your child grows and can even help mitigate those toddler tantrums that could come up later in development! With all this said, schedules get busy and sometimes you just can’t read that same book for the 20th time. That’s okay too. It then becomes important to talk openly with your child about your desire to help them get what they want, but the reality of the limitations you face in that moment. Reassure your child that you will be happy to read that book again, and even set a specific time when you could do it later that day or sometime tomorrow. If you happen to need to shift something in their daily schedule such as you needing to be gone during bedtime, communicate with your child in advance when there will be differences such as another caregiver performing bedtime. Giving that opportunity to talk about what is happening beforehand will be reassuring and ultimately less confusing when the normal routine is altered. Life happens and you might have to be flexible in your handling of a daily schedule, but the important thing is to build as much consistency as you can while also training your child on how to adapt to changes. The next time your child is only wanting more of the same activity, book, show, etc. and you are bored out of your mind just remember: the more your little scientist has time and opportunity to experiment the more they will learn, grow, and thrive! Get down on the floor and try and see something new from their perspective. Participate in the repetitiveness of whatever is happening and seek to promote good, rewarding relationship through your engagement and encouragement. Your child will have a very good chance to excel when you give them the space to play and learn again, again, again!